Tara Klena Barthel formerly served as the Director of the Institute for Christian Conciliation. As such, she oversaw hundreds of conciliation cases (including conflicted church interventions) through the international network of trained conciliators. Tara also provided oversight and leadership for all advanced conciliator training. Currently, she serves her family as a homemaker while occasionally accepting cases as a mediator, arbitrator, and conflicted church intervention team member. Currently enrolled at Reformed Theological Seminary and pursuing her Master's Degree in Religion, Tara consults with businesses and ministries on the legal risk management issues attendant to conflict; designs and presents custom training on biblical conflict resolution for churches, missions agencies, and parachurch organizations; speaks frequently at women’s conferences and retreats; and is currently working on many new writing projects. Tara is the author of the Living the Gospel in Relationships video series and co-author of Peacemaking Women—Biblical Hope for Resolving Conflict (Baker Books, 2005), and Redeeming Church Conflicts--Turning Crisis into Compassion and Care (Baker Books, 2012; second imprint Hendrickson Publishers 2016). Prior to moving to Billings, Montana to join the staff of Peacemaker Ministries, Tara worked as an attorney and business consultant in Chicago. Tara earned her law degree and M.B.A. from the University of Illinois Urbana-Champaign, and her B.A. in psychology from Augustana College (Illinois). 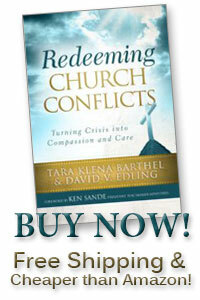 Posted in HOPE in the midst of conflict, Reviews of "Redeeming Church Conflicts"